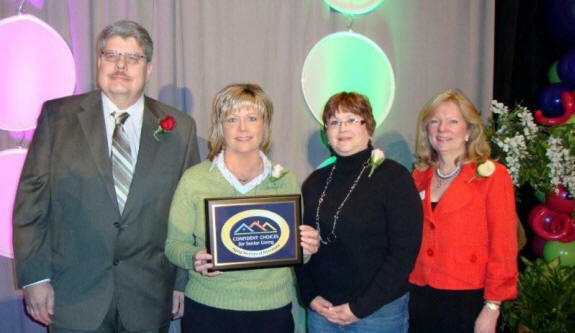 ST. PAUL â€“ Confident Choices For Senior Living, a program designed to improve quality in housing-with-services settings, increase public trust and inform consumer decision-making has awarded a designation to Oak Crest Senior Housing of Roseau. 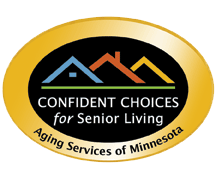 The Confident Choices program was designed by Aging Services of Minnesota, the state's largest association of professionals working in the area of older adult services. "In today's world, consumers can choose from a variety of options when they are exploring senior housing," said Mary Youle, the Vice President of Housing and Community Services for Aging Services of Minnesota. "This program will give consumers confidence they are indeed choosing the right community for themselves or their loved ones." In order to receive this designation Oak Crest Senior Housing met certain core and elective requirements in the areas of ethical practice, management experience and training, customer satisfaction, resident information and communication, regulatory compliance, staff training and satisfaction, performance improvement, resident services, and more. In addition, they successfully completed a site review by two trained housing professionals. The requirements for Confident Choices have been developed by experienced housing-with-services providers and are based on standards of practice that truly influence the quality of a consumer's experience. For over 40 years, Aging Services of Minnesota has earned its reputation as a leader in older adult services. The providers who are members of Aging Services represent the complete continuum of care, including care centers, assisted living, and senior housing with supportive services, independent senior housing and community-based services. 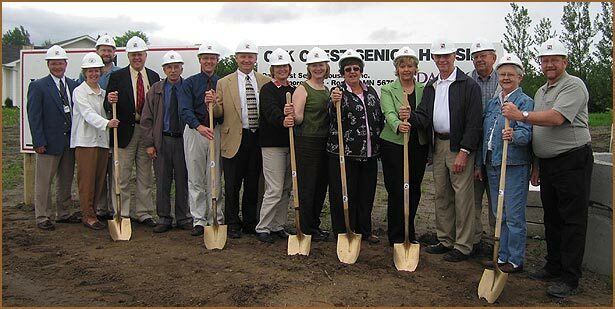 Members of the Oak Crest Senior Housing project turn the ceremonial shovel of dirt at a ground breaking celebration at the facility’s construction site in June. Pictured from left to right: Shannon Carlson, project coordinator; Julie Rokke and Mark Lundberg of YHR Architects; John Marsch, Kraus/ Anderson Construction; Butch Koehmstedt, USDA; Roseau Mayor Jeff Pelowski; Larry Vatnsdal, Citizens State Bank; Board members Sandy Baumgartner, JoAnne Thompson, and Alice Halvorson; Cheryl Gumeringer, Director of Oak Crest; Don Miller, Board of Directors Vice Chairman; Dave Hagen, past RAHH CEO; and Board members Gail Johnson and Mike Hetteen. Absent are Board Chairman John Wahlberg and Dr. Robert Anderson from the Board of Directors. 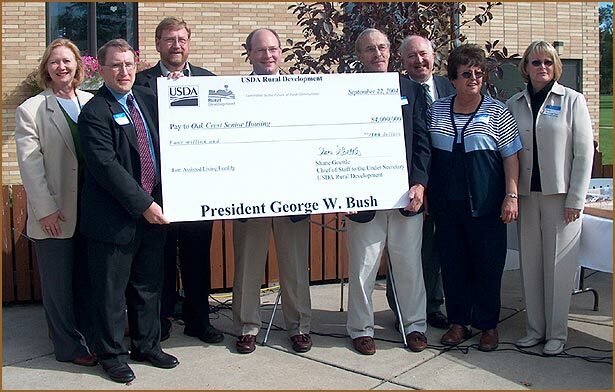 Members of the Oak Crest Senior Housing Board of Directors receive a $4 million check from representatives of the USDA. Pictured from left to right: JoAnne Thompson, USDA national representative Shane Goettle, Mike Hetteen, Shannon Carlson, John Wahlberg, USDA state representative Steve Wenzel, Alice Halvorson, and Sandy Baumgartner.